Right on the Nail ~ OPI Halloween 2014 Peanuts Collection Swatch and Review: Good Grief! I was so happy to get the 4-piece OPI mini Peanuts Collection from my sister-in-law because I never found these in stores (I know I'm not the only one, either). I don't know why these were so elusive, but the collection contains 2 cremes and 2 glitters. Tonight I have the most recognizable yellow Peanuts color called Good Grief! I showed the first picture, but it is not color accurate at all; the second 2 pictures contain a more realistic color. You all know that I hate the OPI mini polishes and especially the brush. My application was absolutely horrible here, but this was mostly due to the brush and not the formula. It was slightly streaky like most yellows, but it wasn't too bad. If you can find these, definitely pick them up if you are a Peanuts fan like me. Have you tried LeChat Dare to Wear polishes before? LeChat is most popular for their gel polishes, but they make regular nail polish colors the same color as their gel counterparts. These are great polishes and you get quite the bang for your buck with just $3 a bottle at Transdesign. Mint Jubilee comes from their Spring 2014 collection, and I can definitely see why. It's a nice mint green creme that rivals polishes twice the price. The formula was fine and I used 2 coats for the swatches. I think 3 might have been better on a couple nails, but you'd never notice if it weren't for the macro photos. Overall, definitely check out LeChat Dare to Wear polishes because they don't get the love they deserve (likely because you can't really find them easily in stores unless you are a professional). Enjoy your Thursday and my lobster hands! Hello hello! I've been swatching the Zoya Satins, so stay tuned for those this week. If you love soft shades, you will love this 6-piece collection. Tonight I have something completely the opposite of the Zoya Satins, and that is Rainbow Honey Frozen Flame which is a party in a bottle. Basically it has gold and holographic bar glitter of different sizes, as well as multiple colors of hexagonal glitter. I meant to post this as a fun topper for New Year's Eve, but I completely forgot about it. This did not come in a mystery bag; I bought the Frozen Flame Set which included things like lotion, cuticle oil, and body spray all with the Frozen Flame scent. I was happy that with 2 coats the polish didn't get really thick like some Rainbow Honey polishes can get (perhaps because this was a full sized bottle?). Currently Rainbow Honey is closed, but will open shortly for the February restock. Oh Sundays. I wish I didn't ruin my Sunday on a migraine. I never used to get headaches, but the last few years has been just full of them. The final OPI Fifty Shades of Grey color I have is Embrace the Gray which is a medium grey creme. No, it's not very unique, but I still love all the greys. The problem I had with it was the formula which was quite watery. I didn't think it was going to be opaque in 2 coats, but it was. Formula problems, but I still loved it. No, I never read any of the Fifty Shades of Grey books, nor do I have any plans to. This fact did not stop me from getting exited about the OPI collection because I love grey polishes. Somehow I only bought 2 of them, but I think Dark Side of the Mood is going to come home with me soon. There is also a mini collection that has all of the polishes, but I hate their mini bottles, so I'm just going to have to get the full sizes of the ones I like best. My favorite of the collection was Shine For Me which is a silver and blue glitter polish. From other blog posts I found that this is opaque on its own, and I only used 2 heavy-handed coats for the swatches above. I love this one since it is so sparkly and you can really see a nice mixture of both colors. I request more grey polishes in collections in 2015! I love 4 day weeks. I went to a conference on Tuesday and Wednesday for work, so today really feels like Monday. It's great! Anyway, awhile back, Ulta had this great unannounced sale where I got 3 butter London polishes (only a select number of shades were a part of the sale) for only $15 (I think). One of the shades was Jack the Lad which is a mossy green with blue, gold and green shimmer. Oh man, I love this so much! The blue stands out more than the gold, and that makes this polish more unique in my opinion. The formula was pretty good, and only 2 coats were needed. You can find butter London polishes at your local Ulta, Macy's, Nordstrom, etc. for $15 each. Pricey, but nice for a splurge. I didn't blog yesterday because I had to go to Charlotte to get another Helmer. My 4th Helmer. Eek, I'm so overwhelmed! So I've had this polish for over a year and a half and I just got around to swatching it last week, Yes, I am a failure at blogging. Well, I guess the bright side is that you get to see it tonight. It's a deep purple with beautiful blue shimmer. You know me and polishes with shimmer of a different color; yes, it is love. The formula was just ok, and the Julep bottles are a bit unwieldy to work with, but the color is worth it. Yes, I have yet another indie brand that I've never tried before named Blue-Eyed Girl Lacquer. The color I have is a stunning blue based teal with multicolored microglitter called Bound to the City Life. Because it is a jelly I thought it would take 3 coats, but this one is extremely opaque in 2 coats. Looking through their website, I see many polishes calling my name. Their prices range from $5 to $12 depending on the polish size and type. You can find out more about Blue Eyed Girl Lacquer on their Facebook, Twitter and Instagram pages. Happy Saturday! I know, I'm showing an October polish, but I hope you still want to see it. Rainbow Honey's Zi is a medium purple with blue, purple, pink and silver microglitter. It's very pretty, but I always have a problem with the polish starting out with a regular formula, and by the third coat, it's a thick mess. Does anyone else have this problem? Zi still needed 3 coats despite it getting thick. Either way, it's a really pretty color. You can get the mini Mystery Bag for only $10 and it's a great deal. You get polishes and other bath products in beautiful scents every month. Remember when I had the Velvet Texture polish from Sally Hansen called Regal? Well, I talked to the Sally Hansen representative and she said they aren't to be officially released until February. Weird, because I found these at my Ulta at the beginning of December. When I went there last, they still had some left so I picked up Lush which is a textured taupe color. It's not as striking as Regal, but a nice way to get away with some texture with a neutral color. Just as a reminder, make sure to let the first coat dry before applying the second or you will get some dragging. Lush took longer to dry than Regal it seems. I noticed on my right hand that I had a few dents after I went to sleep (which was a long time after I did my nails). Have you found these in your area? Yay, another new indie brand to try! I bought a mystery bag that contained polishes from several indie brands that I've never tried, and I was not disappointed. Up tonight is Reverie Nail Lacquer from Etsy with the polish Yuletide. It's a green jelly base with a ton of rainbow circular and hexagonal glitter. I let my bottle sit upside down for about 20 minutes before I started polishing and I had zero problems with getting glitter out (no fishing). Despite this being called Yuletide, I think this is a polish that could be worn year round due to the non-traditional color glitters in here. I used 3 coats, but the formula never got gloopy or problematic. Reverie polishes go for $8 for a full sized bottle, or $3.50 for a mini which is great. You can find more about them on their Facebook or Instagram pages. Ready for Valentine's Day yet? I know, probably not since we just got over New Year's, but on January 14th Chloe & Bella will release 2 polishes that are vastly different. The first polish is called Desire and is the vampy color with a black jelly base filled with various shapes of red and black glitter (micro, hearts, squares, etc.). This was a bit thick, but covered well in 2 coats. It is definitely a topcoat eater so get your Gelous out! The second color is the "sweet" Valentine's Day color called Devotion and is a cool toned pink crelly polish with silver and pink hearts, iridescent glitter, and various pink hexagonal glitters. This was also pretty thick, but nothing unmanageable. Oh, and this will also eat your topcoat. I love this polish; it's just so bright and happy with all of the hearts (I didn't have to fish to get the hearts out at all). These will retail for $11.95 each at Choe & Bella on January 14th. For more information, you can find them on their Pinterest, Instagram, Twitter, and Facebook pages, respectively. Happy Saturday! Tonight I have the other 2014 OPI Designer Series called Tourmaline which is a bright pink with iridescent holographic glitter. Well, this is a bit boring. And for $12.50? I dunno, I thought Titanium was better because the glitter stood out more than this one. This was also quite sheer and needed 3 coats with no application issues. If I were you, I'd save my money on this one. I've been trying to collect the latest offerings OPI has every year for their designer series collection. This year comprised of 2 polishes, and I have both to show you. Up for tonight is Titanium which is a deep grey base with iridescent holographic glitter. I'm sort of torn on this one. I used to love the linear holographic polishes they used to put out and I feel like a glitter polish like this isn't special or deserving of the price increase to $12.50. Sure, it's pretty, but not anything I haven't seen before. I guess you can say that the indie brands have the linear holos under control now, so I guess big brands need to find new ways to change things up. The formula was fine, but it was surprisingly sheer and needed 3 heavy coats for full opacity. Oh, and it eats up topcoat so make sure to use a coat of Gelous to help. For some reason only one polish from the Essie winter collection really resonated with me, and that polish doesn't even look like it belongs in a winter collection (perhaps that's why I liked it so much). I will say I am so excited for the Essie satin polishes as well! Tonight I have Bump up the Pumps which is a pink based coral creme that felt like a fresh breath of air when I put it on. The formula was great and was almost a 1 coater, but you know I always do 2. Zoya Promotion for 6 Free Nail Polishes for $16! --I am so getting this promotion! How awesome is this? A New Year means new colors to discover & fresh looks to try. 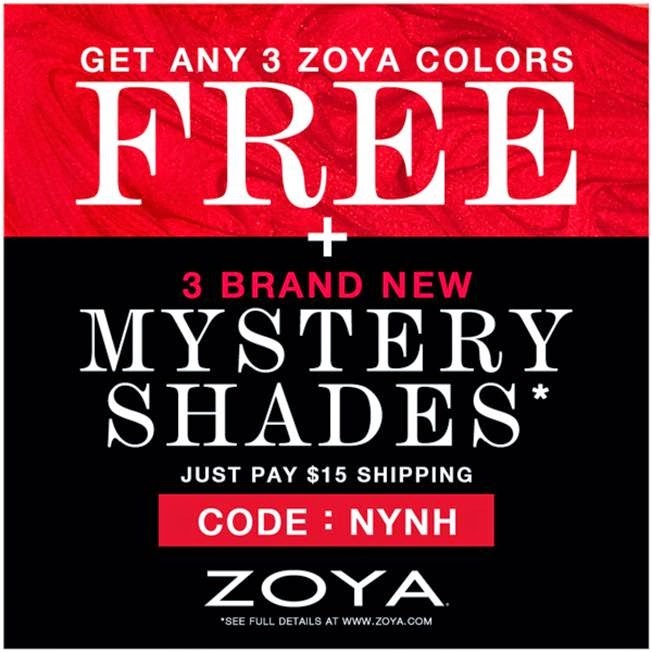 Start 2015 on an extra colorful note with your choice of 3 Zoya Nail Polish shades free PLUS a mini trio (0.25oz) of three (3) exclusive mystery colors*! We don’t want to spoil the surprise BUT we can tell you that the mystery shades were selected by Creative Director, Rebecca Isa, as perfect transitional shades and have never been available for purchase previously.That's not all... for this promotion only, we're opening up shipping to our friends in Canada** as well!